I would just like to start this post off by saying how much I love fall. I know, I’m not the only girl out there who is saying this but it’s more than just pumpkin spice everything for me (although that doesn’t hurt). Personally, I’m not a coffee drinker so no pumpkin spice lattes for me but that leaves more room for apple cider, stewed apples, pumpkin bread, pumpkin pie and big hearty meals full of flavor and carbs! I love the changing of colors, the cooler temperatures and that beautiful layer of fog that hovers slightly over the ground at sunrise. After talking about all of the beautiful scenes outdoors, I just want to bring that inside. When I add something to my collection I ask my self if this would work all the way from September to the end of November. Saying that, I usually don’t purchase witches, ghosts, turkeys and pilgrim décor. By no means am I saying you can’t do that, I just prefer not to. Plus, I’m always looking for a way to save money! The first step for me is to make my house smell like fall. Now, no matter what time of year it is I always have flowers and some kind of candle in my house. I just rotate out scents depending on what season it is. If you have guests coming over, a great idea is to switch your lights off until they cool down and then put a small dab of vanilla extract on the bulb. As it is heats back up when you turn the lights on, it will give a little scent of vanilla that will please your guests and you wont have to worry about a flame if there are any small children. Another great idea is to make a pot of sliced oranges, sliced apples, cinnamon sticks, whole cloves and a few bay leaves. Fill a large pot half way with water and let it simmer. When it comes to the actual decorating part, I love to include as much as I can that is natural. That includes pumpkins, funky looking gourds, corn stalks, mums, wood, pinecones, apples, acorns and of course leaves. The great thing is that majority of these items you can find around your property, a friend’s property or run to the store and they wont cost you much. I also love to incorporate sketches or pieces of fall themed art from local artists or a pieces I have found on a trip. Some stores I love for décor purchases are Homegoods, T.J. Maxx, Marshalls, Hobby Lobby, Magnolia and Antique stores for unique containers. You don’t need to spend a lot to make your home look like a model home. If you are wanting to splurge a little, Pottery Barn and Williams Sonoma are great options too. 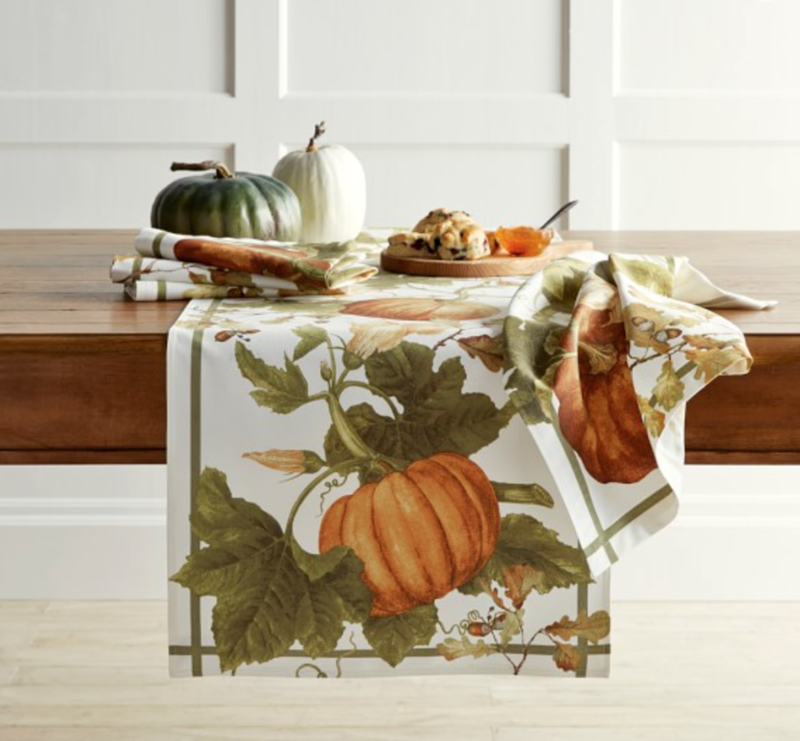 I love Williams Sonoma for their different fall bake ware and table items such as napkins, table cloths and runners. 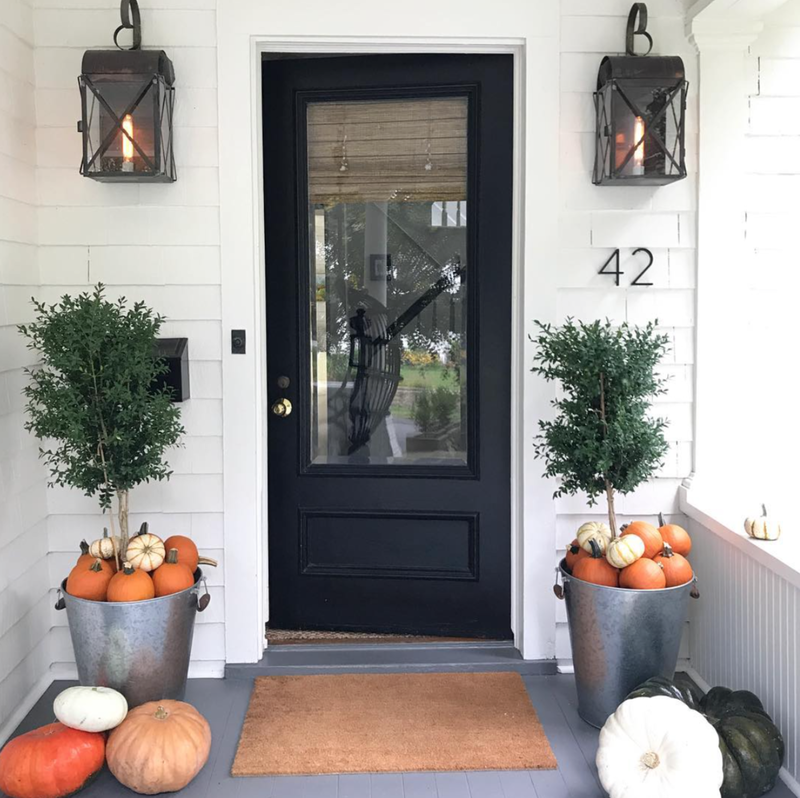 Simple and elegant front porch décor from @most_lovely_things. Pumpkins that will last for years to come. 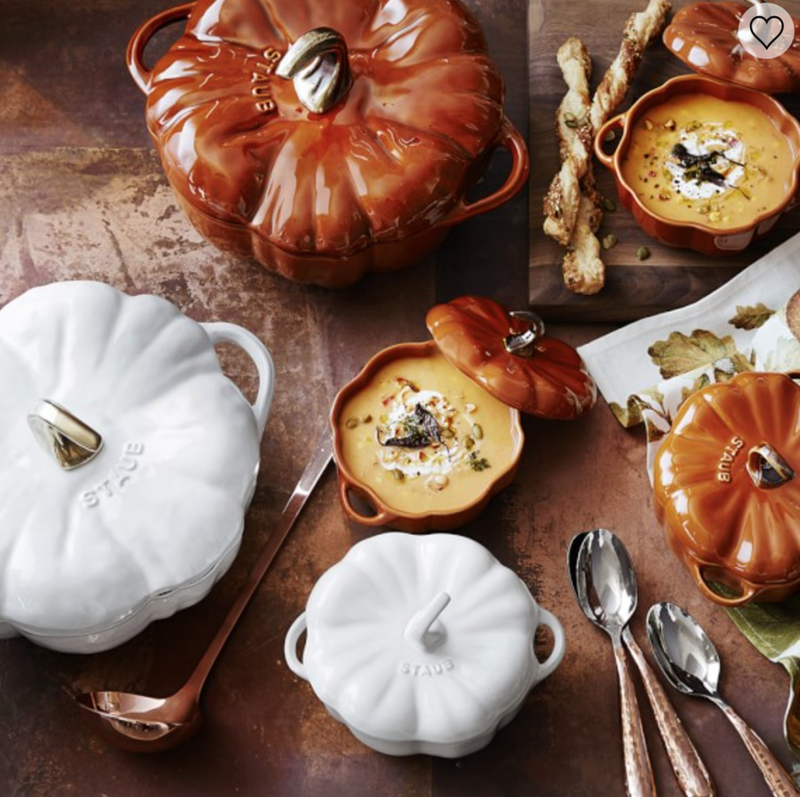 To give your fall dinner a little extra special touch. These also come in other colors. I love the simplicity of a table runner in either direction of the table. Especially if you have a dining table you want to highlight. There is also a tablecloth in this print if you would prefer. If your pumpkin bread comes out of this loaf pan it automatically has to taste good, right? Plus, there are several other designs too. It’s only $13! Get one while they last! To go with your new tapered candles! If you are someone who didn’t get the creative gene, let Instagram and Pinterest be your source of inspiration along with stores like Williams Sonoma and Pottery Barn. I love looking at professionally designed homes and storefronts as a source of inspiration and to help get in the creative mindset. I would love to see how you decorate this fall so mention us in your social media posts!